Fighting Racism. Fairfax Grassroots. Moving forward together. August 12, 2017: White nationalists, neo-Nazis, and other hate groups traveled to Charlottesville, Virginia, to participate in “Unite the Right” rally. Friday evening the hate groups marched through the UVA campus with torches, beating people they confronted with their sticks and surrounding and terrifying people in a church. The next day, one of the White-Suprematists (possibly a member of Vanguard America) intentionally rammed his car into a crowd of demonstrators, killing Heather Heyer and injuring 19 others. Jan 9, 2017: Rev. 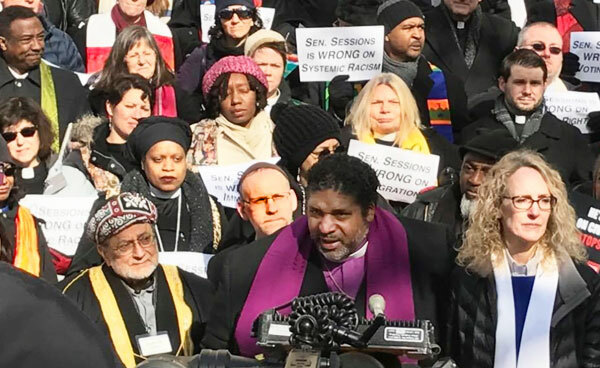 Dr. William Barber II and about 250 members of the interfaith community gathered and marched to the Russell Senate Office Building to protest & appeal to the better angels of the US Senators considering confirmation of Jeff Sessions for Attorney General. Southern Poverty Law Center. Monitors activities of domestic hate groups and other extremists – including the Ku Klux Klan, the neo-Nazi movement, neo-Confederates, racist skinheads, black separatists, antigovernment militias, Christian Identity adherents and others. Fairfax County NAACP. Unit 7066 P. O. Box 6661, Alexandria, Virginia 22306. Meetings are held on the second Saturday of every month at Kings Park Library, 9000 Burke Lake Rd, Burke, VA. Showing Up for Racial Justice (SURJ) NoVa. "Our focus is on working with white people who are invested in anti-racism and want to take action for racial justice." Participates in protests and other actions connected w police shootings. Meets at UUCF Chapel, 2709 Hunter Mill Road, Oakton, VA.
ACLU NoVa Chapter. The ACLU of Virginia works toward ending discrimination on the basis of race, religion, gender, national origin, ethnicity, sexual orientation, disability and other classes of persons subject to stereotyping. The NOVA Chapter Board meets the second Wednesday evening of every month in Old Town Alexandria. Call (703) 360-1096 or email novachapter@acluva.org if you would like to attend. 1. Why I told the Senate that Jeff Sessions thought civil rights groups were 'un-American' , J. Gerald Herbert, The Washington Post, Nov. 22, 2016. 2. "Will Jeff Sessions Roll Back Civil-Rights Protections?" Adam Serwer, The Atlantic, Nov. 18, 2016. 3. "Sessions Defends Trump On Muslim Ban, Says It's 'Appropriate To Begin To Discuss This'," Miranda Blue, Right Wing Watch, Dec. 10, 2015. 4. "How Donald Trump Will Make America White Again," Julianne Hing, The Nation, Jan. 4, 2017. 5. A Witness to Terrorism in Charlottesville, New Yorker, Charles Bethea, August 13, 2017.